Once upon a time books wore nothing more than a leather jacket. This could be decorated, it’s true, and be inscribed with the title and author’s name; brands burned into an animal’s hide. More recently, books began wearing paper covers sporting bold designs, but also an ever increasing baggage of quotes and comments and general blurb. 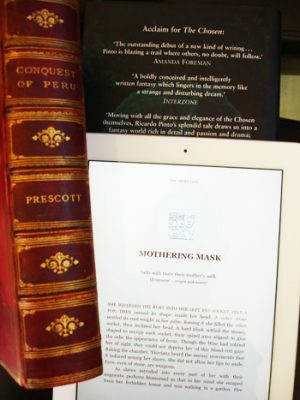 Though this clothing can serve to make a book into a seductive and glamorous object, it seems to me that it is a false skin, a disguise – for it is generally only the content of the book that the author is responsible for; the cover is produced by other people, often with little direct understanding of the content, and whose focus – quite naturally – is a commercial one: a desire to get the book sold. Ebooks are a return to presenting texts naked. If they are clothed at all it is in the shell of the ebook-reading device that they inhabit. Of course they will still, in a concession to tradition, possess a cover, but this will now consist of just another page. All the blabber of blurbs will be similarly demoted. Functionally, the ‘hook’ of the cover is now replaced by a downloaded sample: a free portion of the actual text of the book – analogous, in some ways, to the trailer for a movie. This seems to me a profound development: a reader’s first point of contact is with the work itself – a connection between reader and author that is not only unmediated, but honest.